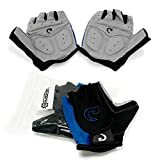 ACTIVE PROTECTION: Gel-Foam padding relieves pressure on ulnar and median nerves for riding comfort.Protect from the stresses of active training. COMFORTABLE FEELING: Fingerless option makes fingers breathable more and flexible top hand fabrics. The sticky velcro buckle and it fit wrist without being tight. QUALITY MATERIAL: Microfibre and polyester fibers cloth on the surface, palm offers exceptional grip & durability, the terry cloth design on thumbs is mainly used to wipe the dripping. 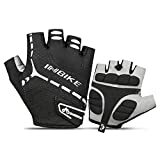 YOKGO Cycling Gloves, Mountian Bike Gloves. 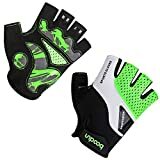 Half Finger Pad Bike Sporting Cycling Gloves. The Yokgo Cycling is a Half padded gloves for bikers. 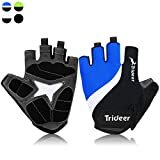 The gloves particularly designed to provide comfortable compression and support for all sports lovers including bikers and cyclists. The fingers are free so you can perform simple tasks without removing the gloves. It can be used to wipe the sweat and even protect riders from falling. The yokgo Half Finger Gloves provide all the comfort, protection and quality you need while being outdoors. The fabric of band back exhales freely to make you feel cooler. The palm fabric is skip-proof. The distinctive thickening palm pad can consume the shock and reduce insensitivity on the bumpy road effectively. 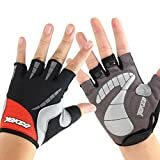 All in all, buying a good pair of gloves not only can improve riding pleasure, but also can enhance the overall sense of clothing. Specially designed to provide comfortable compression and support for all sports lovers. 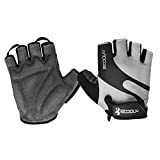 Yokgo Cycling Gloves is specifically designed to provide comfortable compression and support for all sports lovers. Best washed by hand. You only need to soak the gloves with soap, then rub and wash, dry it in the shade. Never use bleach, hot water, and other drastic corrosive wash.